But can the crew of the Enterprise survive something worse than the Klingons, Romulans, and Khan combined? This came about in that wacky way when you are looking for YouTube videos and something curious pops up on the side. I have zero idea why I clicked to watch the remix of Captain Kirk watches Miley Cyrus performance especially since I had taken a vow never to know about Miley Cyrus. Alas, your principles may need to be cast off in the name of ds106 Art (damnit). It’s well done as a remix, as the images of the spectacle pasted on the screen, but the expressions of the Enterprise crew blend well to the spectacle, but it gets a little tricky where the music is mixed in. I wondered what could be more vile to put on the screen? Easy enough to find clips, I used short clips from I’m a Little Robot and the very lethal Wheels on the Bus. 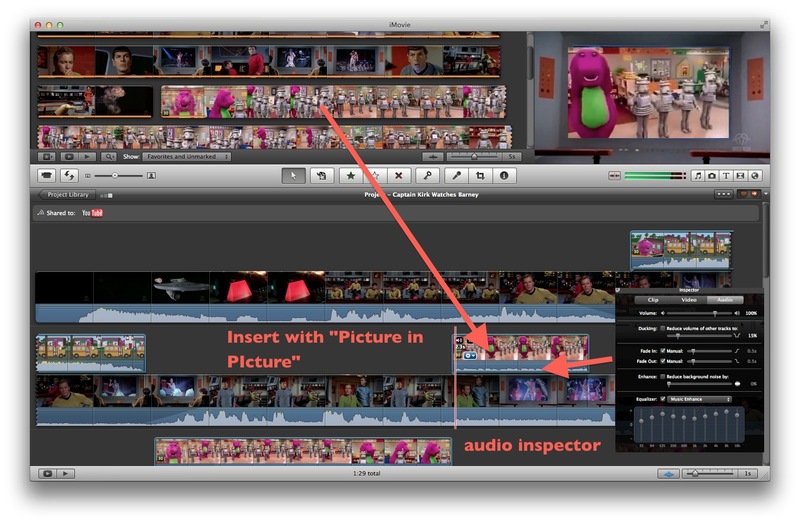 Importing into iMovie, it was a matter of using the PIcture in Picture insert method to place the clips over the screens of Miley Cyrus. There is a bit of a skewness from the tilt of the original, but I can live with it. I set the view options (bottom slide) to stretch out the view the most so I could pin pint the in and out points (dragging the end clips of the Barney overlay). I used the audio inspector on the Barney clips to boost the sound (music equalizer), and sometime to add fade in / fade out points. The longer sequence where Wheels in the Bus was playing took an extra twist- I imported the clip a the end of the star trek sequence, then used the Clip menu to detach the audio, and dragged that under the Star trek scene where I wanted to hear the music (then deleting the video part). 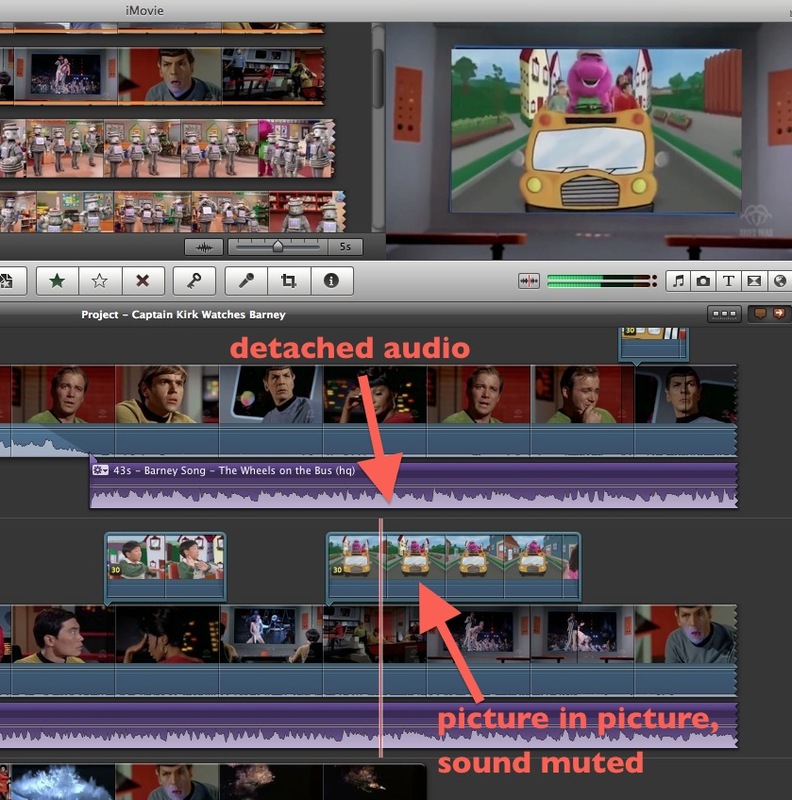 When I dragged the clips in for Picture in Picture, I muted those clips since I had te audio track. There was some trickiness in trying to line up the video, and its not perfect, but who is? This seemed to make for a great remix exercise- who might you put on the screen that would terrify and blow up the Enteprise? What could be worse than Barney? That is your ds106 mission… Star Date NOW!